It can be a challenge to come up with new projects year after year, especially when we have to develop our Summer Camp Program shortly after Christmas. Parent Map’s Camp Fair is always held in February at St. Thomas School in Medina – and we must have our program or at least our camp schedule done by then, preferably with some inspiring samples to showcase too. This year, just as we were winding down from our busy holiday season and turning to a quickly growing backlog of auction projects, we weren’t able to finish a single camp project by the time the camp fair came around. But luckily, our ideas and inspirations never stop percolating! And somehow, we always manage to come up with a new slate of projects to delight kids of all ages. This year, we found encouragement in abstract designs. 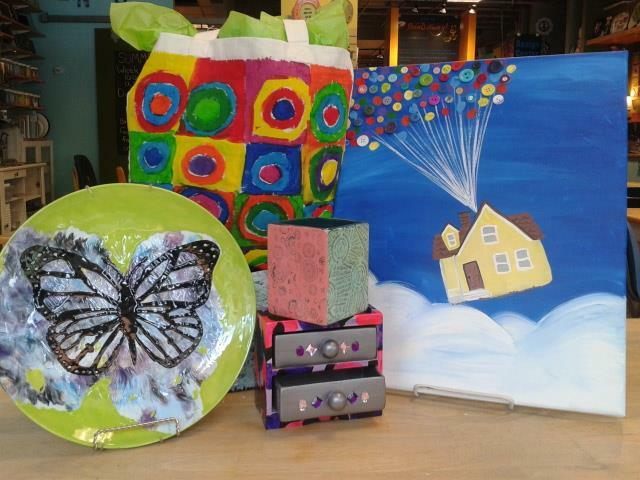 Take a look at our painted canvas bag and one of our painted canvas frames for 6 to 8 year olds. We also found inspiration from the movie “Up” with our darling canvas painting/mixed media project for kids 9 years old and up. We enjoyed creating the “Square Box Totted-up” because our campers get to pick their own “tots” to create a habitat for them. Our robot paper-mache was inspired by Star Wars droid (though ours look better, IMHO). We hope to bedazzle our campers with the glass picture frame – something that will hopefully sit on their dresser with pictures of them with friends for many years to come (and serve as a reminder of the camp they attended here). We created so many projects – some simple, and some more complex for the older campers. We will teach painting techniques along the way, and teach other types of medium such as clay, paper mache, glass fusing, and tye dying. But most of all, we hope this year is as enjoyable as all the other years that have inspired some kids to enroll for art camp twice in the same summer, because they had such a blast that they can’t fathom seeing it end! Enjoy the photos from our different camp offerings. Posted on June 23, 2015 by Hazel Roos and filed under Happenings and tagged summer camp.